Yep, I can smell the Friday too. We'll talk it over the saaaalad and carrotinis. What does it mean when two bunnies give *each other* the 'talk-to-the-tail' treatment? It means trubble. I have been too busy worrying Carrotinis and salads to even think about Friday. Thanks for the heads-up fellas. I disagree, folks. 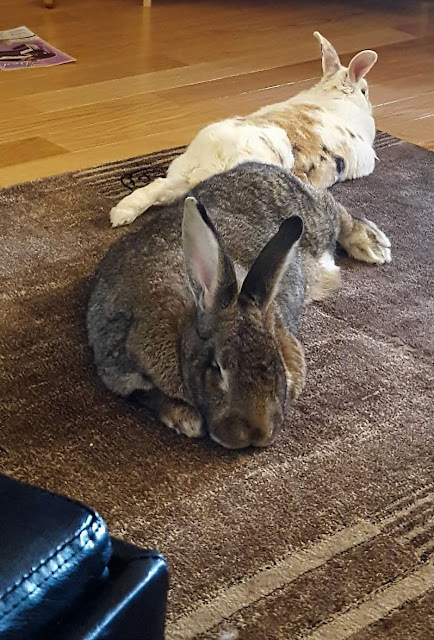 We have here two rabbits, just chillin', hanging out on the area rug thinking of snacks. It's as though they don't disapprove of anything. I think for the sake of life as we know it, they decided to disapprove in opposite directions, then again, the mystery that is bunn.